Madonna with the Child on the throne, John the Baptist and the Evangelist John, or the Altar of Bardi. “In the church of Santo Spirito in Florence, he painted a board for the Bardi Chapel, carefully executed and beautifully finished, where there are olives and palm trees, drawn out with great love” Vasari. 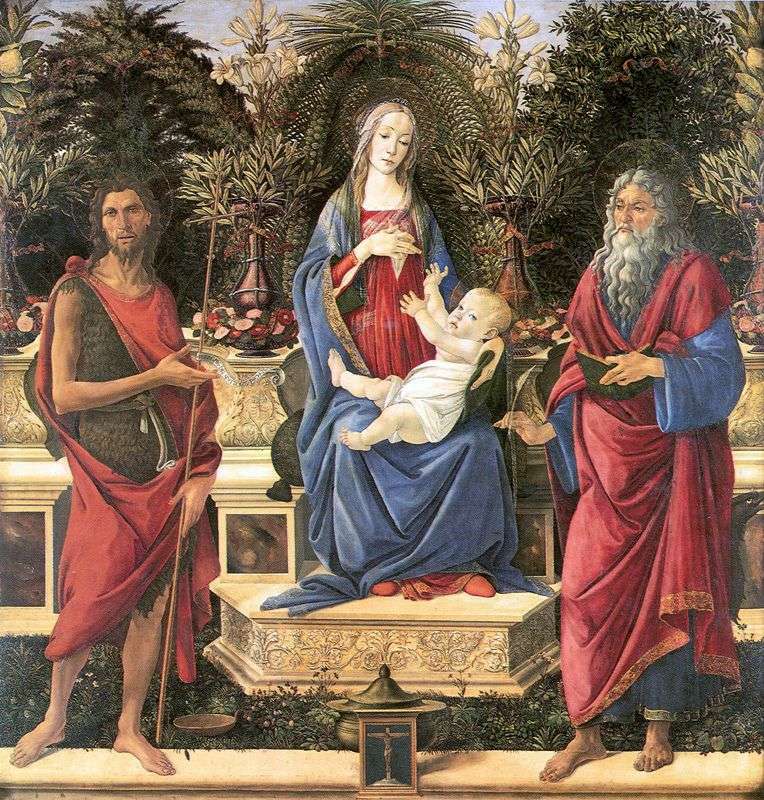 The painting “The Madonna with the Infant on the Throne, John the Baptist and the Evangelist John”, also known as the Bardi Altar is one of the most impressive works of Botticelli, written by the order of Giovanni de Bardi. This financial tycoon of his time made a fortune on the fur trade in England, and also headed the London branch of the Medici Bank. Returning to his hometown, he built a chapel in Santo Spirito, the altar image for which ordered Botticelli. The upper part of the altar and the side doors are still in the Bardi Chapel, taken from the choir. The altar image itself is kept in the Saatlih Museum in Berlin; unfortunately, the frame created by the famous architect and wood carver Giuliano da Sangallo was lost. In the center of the scene on the throne sits the so-called. Madonna Breastfeeding, she opens her breast to feed the Babe sitting on her lap. On either side of the throne are John the Baptist and the Evangelist John, the patron saints of the altar client, Giovanni de Bardi. The sermons of Savonarola had a strong influence on many talented, religious people of art, and Botticelli could not resist. Joy, the worship of beauty forever left his work. If the previous Madonnas appeared in the solemn grandeur of the Queen of Heaven, now this is a pale woman with tears full of eyes, a woman who has known and experienced much. The features of the face, hands of the Madonna are becoming more elongated, fragile, unearthly. The whole figure of Our Lady, the vertical folds of clothing, the blue stripes of the robe, the loose strands of hair underscore the upward direction. The face of the baby is full of childish sadness. To the right and to the left of the throne, as the honorable retinue of the Mother of God, the baptized John the Baptist and the Evangelist John. Their faces are severe, sad, wrinkled with suffering and hardship. John the Baptist, patron of the city of Florence, is clothed over a woolen tunic in a red cloak. On the grass at his feet lies the baptismal bowl, the Forerunner’s hand attracts the viewer’s attention to the Madonna and the Child. Botticelli wrote another saint, John the Evangelist, in the image of a venerable old man. In his hands he traditionally holds a book and a feather, because of his back a huge eagle, one of the four beasts, symbolizing the Evangelist John, is looking out. The composition of Bardi’s altar was unusual for that time: Botticelli showed a special solution to the classical three-part composition depicting Madonna on the throne and the two saints. He used for the structural background is not traditional architectural, and plant elements. The surrounding flora, wicker gazebo, interior items – everything is painted with unearthly decorative, as in other works of this period, for example, in the film “Spring”. All the flowers and fruits in the picture bear a symbolic load. Like many works of the Renaissance, Botticelli painted a lemon tree instead of cedar. Probably, this confusion was caused by the fact that the Latin word “cedrus” in Italian translation has two meanings – cedar lemon tree. Description and meaning of the painting Altar of Bardi by Sandro Botticelli.